Summary: Some people might say this about this slow moving slice of life. Others will find it unusual and rather lovely. A few years ago I saw an odd little film called The Story of The Weeping Camel. Ostensibly about a rejected camel foal it was really almost a documentary about life today in Mongolia, and was nominated for an academy award. Now the same team have reassembled and returned to Mongolia to make The Cave of the Yellow Dog. Nansa, the oldest daughter of the nomadic Batchuluun family, finds a dog out on the steppes and brings it back to the yurt. Her father, convinced that the dog has been attacking their sheep, refuses to allow her to keep it, and when they pack up to move to new pastures, Nansa must decide whether to defy her father or lose her dog. And that’s about it really. Nothing much happens, there’s no three-act structure, reversals, character arcs. 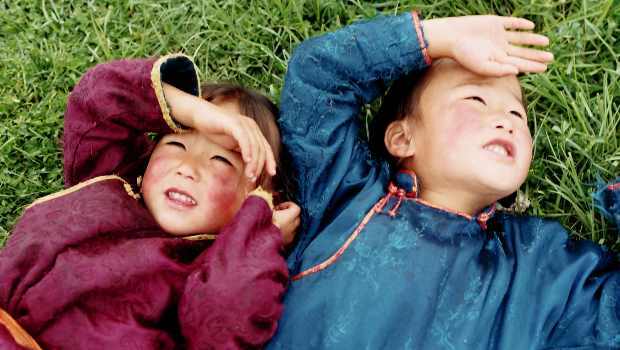 The film is a meditation on what it means to be Mongolian, and the challenges faced by the traditional nomadic community in the face of creeping urbanisation. It dwells on the everyday activities, from making cheese to collecting dung; a trip to the city and the purchase of a new ladle; herding the sheep and keeping the family together. How much you enjoy it will probably depend on your tolerance for incredibly cute apple cheeked children. Nansa and her siblings are so adorable that they give you a slight toothache; they’re also resilient, independent, resourceful and useful around the yurt in a way that Western parents can only dream of. Nansa is slung up onto a far too big for her pony, she is sent out to collect dung, she spends her days outside, often alone. She is already at boarding school. The old showbiz adage never work with children or animals has been completely ignored but with absolute success – the kids are totally natural in front of the camera and the adults pretty much get on with things. It’s an idyllic life in some ways but physically tough, and you’d imagine that in winter it must be quite boring. And some people might say this about this slow moving slice of life. Others will find it unusual and rather lovely.